NFκB is implicated in cancer and bone remodelling, and we have recently reported that the verified NFκB inhibitor Parthenolide (PTN) reduced osteolysis and skeletal tumour growth in models of metastatic breast cancer. Here, we took advantage of in vitro and ex vivo bone cell and organ cultures to study the effects of PTN on the ability of prostate cancer cells and their derived factors to regulate bone cell activity and osteolysis. PTN inhibited the in vitro growth of a panel of human, mouse and rat prostate cancer cells in a concentration-dependent manner with a varying degree of potency. In prostate cancer cell—osteoclast co-cultures, the rat Mat-Ly-Lu, but not human PC3 or mouse RM1-BT, enhanced RANKL stimulated osteoclast formation and PTN reduced these effects without affecting prostate cancer cell viability. In the absence of cancer cells, PTN reduced the support of Mat-Ly-Lu conditioned medium for the adhesion and spreading of osteoclast precursors, and survival of mature osteoclasts. Pre-exposure of osteoblasts to PTN prior to the addition of conditioned medium from Mat-Ly-Lu cells suppressed their ability to support the formation of osteoclasts by inhibition of RANKL/OPG ratio. PTN enhanced the ability of Mat-Ly-Lu derived factors to increase calvarial osteoblast differentiation and growth. Ex vivo, PTN enhanced bone volume in calvaria organ—Mat-Ly-Lu cell co-culture, without affecting Mat-Ly-Lu viability or apoptosis. Mechanistic studies in osteoclasts and osteoblasts confirmed that PTN inhibit NFκB activation related to derived factors from Mat-Ly-Lu cells. Collectively, these findings suggest that pharmacological inhibition of the skeletal NFκB signalling pathway reduces prostate cancer related osteolysis, but further studies in the therapeutic implications of NFκB inhibition in cells of the osteoblastic lineage are needed. NFκB is implicated in cancer and bone remodelling [1, 2, 3, 4, 5, 6, 7, 8, 9]. Previous studies have shown that pharmacological and genetic inhibition of key components of the NFκB signalling pathway reduce bone loss associated with various bone disorders including bone metastasis, oestrogen deficiency, rheumatoid arthritis and Paget’s disease of bone [10, 11, 12, 13, 14]. The canonical NFκB signalling pathway consists of a family of transcription factors. Stimulation of receptors for various bone- and tumour-derived factors including receptor activator of NFκB ligand (RANKL), tumour necrosis factor alpha (TNFα), cluster of differentiation 40 ligand (CD40L) and interleukin-1 (IL-1) triggers a series of events that include the recruitment of adaptor proteins such as TRAF2 and 6 to the receptor, the assembly of the inhibitor of IκB (IKK) complex and the phosphorylation and subsequent proteasomal degradation of IκB units leading to the translocation of NFκB dimers to the nucleus [15, 16]. Activation of cancer- and host-specific NFκB signalling by these factors plays a key role in the initiation and progression of cancer related osteolytic and osteosclerotic bone metastases [17, 18, 19, 20, 21]. The skeleton is a common site of metastasis in advanced prostate cancer. The homing, colonization and growth of metastatic prostate cancer cells in the skeleton are major causes of pathological fractures and bone pain in advanced cancer patients [22, 23, 24]. The majority of prostatic bone metastases in patients are predominately osteosclerotic and are frequently accompanied by enhanced osteoblast differentiation and ectopic bone formation [25, 26]. However, the ability of prostate cancer cells to enhance the formation, survival and activity of osteoclasts by both directly and indirectly acting on osteoblasts, also contributes to the development of osteolytic lesions [24, 26, 27, 28, 29, 30, 31]. A number of studies have implicated NFκB in the initiation, progression and bone metastasis of prostatic tumours [10, 29, 32, 33, 34, 35, 36, 37, 38, 39, 40, 41, 42]. NFκB plays a role in the growth and metastatic spread of androgen-independent prostate cancer cells [35, 36, 37], and pharmacological inhibition and knockdown of key components of NFκB signalling such as IKK have been found to reduce prostate cancer cell growth and metastasis [10, 29, 32, 33, 34, 35, 36, 37, 38, 43]. We have recently reported that a verified inhibitor of canonical NFκB signalling, Parthenolide (PTN) [44, 45, 46], reduced breast cancer associated bone disease in mouse models [47, 48, 49]. Inhibition of NFκB has been found to enhance osteoblast differentiation and maturation in the presence [47, 49] or absence  of cancer cells, however the effects of NFκB inhibitors on the ability of prostate cancer cells to influence osteoblast differentiation, osteoclast formation and osteolysis has not been investigated. In the present study, we show that PTN inhibited prostate cancer cell-related NFκB activation in osteoclasts and osteoblasts, reduced osteoclast formation and enhanced osteoblast differentiation in the presence of cancer cells in vitro and increased bone volume in an ex vivo model of prostate cancer cell—calvarial organ co-culture system. The sesquiterpene lactone, parthenolide (PTN) was purchased from Tocris Biosciences (Bristol, UK). The human androgen-sensitive prostatic cancer cell line, LNCaP and the human castration-resistant cell lines PC3 and DU145 were purchased from the ATCC (Manassas, VA). The rat Mat-Ly-Lu cells were a gift from Professor Daniel Chappard (INSERM, Angers, France). The LNCaP bone metastatic derivative C4-2B4 was a kind gift from Dr. Ning Wang (University of Sheffield). The murine RM1-BT prostate cancer cells were a kind gift from the laboratory of Dr. Martina Rauner and Professor Lorenz Hofbauer (Dresden, Germany). All cancer cell lines were grown in Dulbecco’s Modified Eagle Medium (DMEM), obtained from Sigma–Aldrich (Dorset, UK) with 10% foetal calf serum. Primary bone marrow derived macrophages, mature osteoclasts and calvarial osteoblasts were cultured in alpha-Modified Eagle Medium (αMEM). Primers for quantitative PCR were obtained from Invitrogen (Paisley, UK) and probes were purchased from Roche Diagnostics Ltd. (East Sussex, UK). Western blot antibodies were obtained from Cell Signalling Biotechnology (MA, USA) except rabbit anti-actin was purchased from Sigma–Aldrich (Dorset, UK). Mouse macrophage-colony stimulating factor (M-CSF) was obtained from R&D Systems (Abingdon, UK) and RANK ligand (RANKL) was a gift from Patrick Mollat (Galapagos SASU, France) . The effect of Parthenolide on cell viability was measured by Alamar Blue as described in . Prostate cancer cells (1 × 103 cells/well) were cultured in serum free DMEM and M-CSF dependent osteoclast precursors or calvarial osteoblast (10 × 103 cells/well) were cultured in standard αMEM medium in the presence of vehicle (DMSO) or PTN at the desired concentration and for the period indicated. The effects of Parthenolide on cell adhesion and spreading were measured using the XCELLigence system . Briefly, standard DMEM medium containing vehicle or PTN was added to the E-plate (16-wells) and a base reading for normalisations was calculated. Prostate cancer cells (9 × 103 cells/well) were then added in standard DMEM supplemented with vehicle (0.1% bovine serum albumin in PBS) or RANKL (100 ng/ml) and cell adhesion and spreading were measured as previously described . The effects of PTN on the development of prostate cancer related osteolysis were measured using an adaptation of the ex vivo mouse calvarial organ culture system . Briefly, murine calvaria were isolated from 7-day-old [C57/Bl6] mice, divided in half equally along the medium sagittal suture and each half was cultured on stainless steel rafts in 48-well plates. The standard alpha-MEM tissue culture medium containing test agents was changed every 48 h and the cultures were terminated on day 7. The experimental protocol was approved by the Ethics Committee at the University of Edinburgh and was conducted in accordance with the UK Home Office regulations. Bone volume was measured at the calvarial bone using microCT analysis [Skyscan 1172 instrument (Brucker, Belgium)] at a resolution of 5 µm . Images were reconstructed by the Skyscan NRecon program and analysed using Skyscan CTAn software (Brucker, Belgium). Bone marrow (BM) cells were flushed from the long bones of 3–5 week old mice as previously described . M-CSF dependent bone marrow macrophages (osteoclast precursors) were plated into 96-well plates (15 × 103 cells/well) in standard alpha-MEM supplemented in the presence of M-CSF (100 ng/ml) for 48 h and then and in M-CSF (25 ng/ml) and RANKL (100 ng/ml) for up to 5 days. For studies involving prostate cancer cells and their derived factors, M-CSF (25 ng/ml) and RANKL (100 ng/ml) were added 6 h prior to the addition of prostate cancer cells (300 cells/well) or their conditioned medium (20% v/v) prepared as previously described  Cultures were terminated by fixation in 4% paraformaldehyde, and mature osteoclasts were identified by Tartrate-Resistant Acid Phosphatase (TRAcP) staining . Osteoclast activity was assessed by measuring resorbed area in mature osteoclasts cultured on Corning® Osteo Assay Surface multiple well plates (Corning, USA). Resorption pits were visualized on an Olympus ScanR microscope and resorbed area was quantified by using ImageJ software. Primary osteoblasts were isolated from the calvarial bones of 2-day-old mice as described previously . 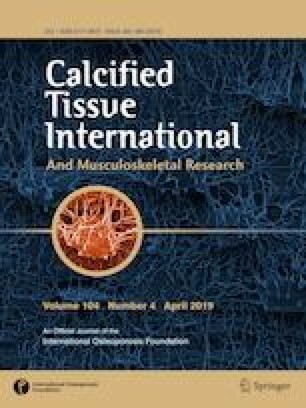 Calvarial osteoblasts (1 × 105 cells/well) were cultured in standard alpha-MEM for the desired period and osteoblast cell number and differentiation were determined by AlamarBlue assay and alkaline phosphatase (Alk Phos) assays, respectively . Adherent and non-adherent cells were collected, fixed with 4% paraformaldehyde and cytospun into glass slides. Apoptosis was identified using DAPI staining and TUNEL staining . An average of 6 microscopic fields per group was analysed at ×200 magnification and the number of apoptotic cells were quantitated in relation to total cell number. Western blot analysis was used to detect the expression of total proteins and their phosphorylated forms in prostate cancer and bone cells. Briefly, cells were incubated in serum free medium with or without test agents for 60 min and then cells were treated with cytokines or conditioned medium from cancer cells and homogenized and collected in lysis buffer (0.1% (w/v) SDS, 0.5% (w/v) sodium deoxycholate, 1% Triton X-100, 1 mMEDTA, 2% (v/v) protease inhibitor cocktail, 10 mM of sodium fluoride and 2% (v/v) phosphatase inhibitor cocktail). Protein concentration was determined using BCA assay (Pierce, USA). Total protein (50–70 µg) was resolved by SDS–PAGE (BioRAD, UK) and immunoblotted and native and phosphorylated proteins were detected by using the indicated rabbit monoclonal antibodies (all at 1:1000 dilution), and immuno-complexes were visualized using chemiluminescence (Amersham, UK) on a Syngene GeneGnome imaging system. Bands were quantified using GeneSnap software (Syngene, UK) and level of actin (Sigma–Aldrich, UK) was used for normalization. Quantitative PCR (qPCR) was used to detect RANKL and osteoprotegerin (OPG) gene expression in calvarial osteoblasts. Briefly, RNA was quantified using a nanodrop (Thermo Scientific) and complementary DNA (cDNA) was generated using Invitrogen SuperScript III Reverse Transcriptase kit according to manufacturer’s instructions. For amplification of mouse OPG (forward primer: 5′- ATGAACAAGTGGCTGTGCTG-3′, reverse primer 5′-CAGTTTCTGGGTCATAATGCAA-3′); mouse RANKL (forward primer: 5′-TGAAGACACACTACCTGACTCCTG-3′, reverse primer 5′-CCACAATGTGTTGCAGTTCC -3′); mouse GAPDH (forward primer: 5′- CCTGAATTTTAAGCTACACACAGC -3′, reverse primer 5′- CTGGCACTGCACAAGAAGAT -3′) were used. GAPDH was used for cDNA normalization. Comparison between groups was assessed by analysis of variance (ANOVA) followed by Dunnet’s post hoc test (SPSS for Windows, version 11). A p-value value of 0.05 or below was considered statistically significant. The half maximal inhibitory concentration (IC50) values were calculated using GraphPad Prism 7 software (V10, Microsoft, USA). A body of work has implicated NFκB signalling in the progression of prostate cancer cells from androgen sensitive to androgen independence [29, 32, 35, 36, 37, 38, 39]. With this in mind, we first assessed the cytotoxic effect of the verified NFκB inhibitor PTN on the in vitro viability of a panel of prostate cancer with different abilities to metastasise to the skeleton. As shown in Fig. 1, PTN (0.001–100 µM) reduced the viability of the human androgen-sensitive prostatic cancer cell line LNCaP and its metastatic sub-clone C42-B4, human castration-resistant cell lines PC3 and DU145, mouse RM1-BT and rat Mat-Ly-Lu in a concentration-dependent manner. The concentration of this compound that half maximally inhibited cell viability (IC50) was significantly lower in the metastatic PC3, RM1-BT and DU145 cells when compared to other cell lines tested (Table 1). NFκB plays a key role in RANKL-induced osteoclastogenesis [11, 12, 13], and previous studies have shown that PTN reduces osteolysis in models of breast cancer bone metastasis [44, 45, 46, 47, 48, 49]. Here, we tested the effects of PTN on the ability of prostate cancer cells to influence RANKL-induced osteoclastogenesis in vitro. To investigate this, we first assessed the ability of a panel of human and murine prostate cancer cell lines to enhance osteoclast formation in cultures of mouse M-CSF generated bone marrow macrophage (osteoclast precursors) at various concentrations of RANKL (5–100 ng/ml). These experiments revealed that pre-treatment of osteoclast precursors to the prostate cancer cells Mat-Ly-Lu—but not PC3 and RM1-BT (Fig. 2a and data not shown) or their derived factors (Fig. 2b and data not shown) enhanced RANKL-induced osteoclast formation (p < 0.001). Furthermore, exposure of osteoclast precursors to PTN (0.1–1 µM) for 1 h prior to the addition of Mat-Ly-Lu, PC3, RM1-BT or their derived factors reduced osteoclast formation in these cultures (Fig. 2a, b). Representative photomicrographs of TRAcP positive multi-nucleated osteoclasts from the prostate Mat-Ly-Lu—osteoclast co-cultures described are shown in Fig. 2c. RANKL is an essential regulator of motility of osteoclasts and their precursors [56, 57]. Here, we show that Mat-Ly-Lu conditioned medium induced adhesion and spreading of RANKL and M-CSF generated osteoclast precursors (Fig. 3a) and this effect was completely abolished in cultures treated with PTN (0.1 µM) treated cultures completely abolished by PTN (0.1 µM) after 6 h. In contrast, PTN (0.1–1.0 µM) had no effects on the proliferation of RANKL and M-CSF generated osteoclast precursors for up to 24 h at concentration tested (Fig. 3b), thus excluding the possibility that the inhibitory effect on osteoclast motility was mediated by a reduction in cell viability in the experiment described. Next, we went on to carry out additional experiments on the effects of PTN on mature osteoclast activity and survival. Mature osteoclasts were generated in RANKL and M-CSF stimulated bone marrow macrophage cultures for 3 days, and then exposed to rat Mat-Ly-Lu conditioned medium (20% v/v) in the presence and absence of Parthenolide (PTN). The results of this experiment revealed that the ability of mature osteoclasts to form resorption pits in vitro was only reduced by PTN at 30 µM (Fig. 3c)—a concentration that significantly decreased the survival of mature osteoclasts in the model described (Fig. 3d). At 1 µM, PTN had no effects on bone resorption or survival of mature osteoclasts (Fig. 3c, d). Osteoblasts are an essential source of RANKL . In view of this, we next tested the effects of PTN on osteoblast support for osteoclastogenesis in the presence of derived factors from prostate cancer cell. Conditioned medium from the prostate Mat-Ly-Lu cells was used in these experiments on the basis that these cells enhanced osteoclast formation in RANKL stimulated bone macrophage cultures (Fig. 4). Pre-treatment of calvarial osteoblasts with PTN (1 µM) prior to the addition of condition medium from Mat-Ly-Lu cells and bone marrow macrophages reduced the increase of RANKL/OPG ratio after 24 h (Fig. 4a), and inhibited osteoclast formation after 48 h (Fig. 4b). 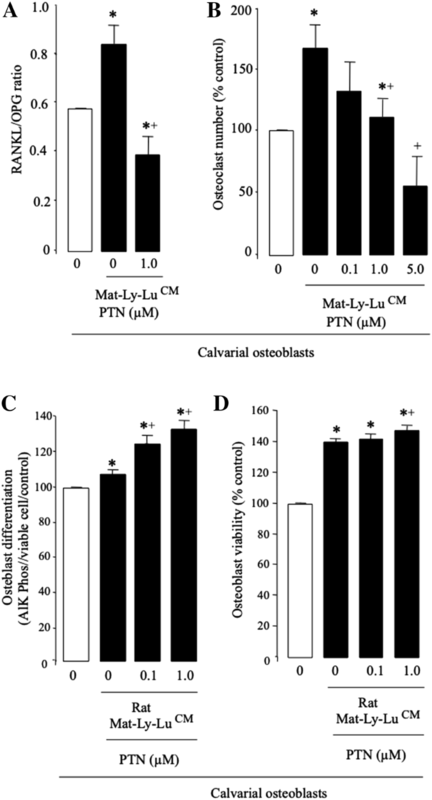 At 5 µM, PTN completely abolished the increase in osteoclast number by condition medium from Mat-Ly-Lu cells in calvarial osteoblast cultures (Fig. 4b). Osteoblastic lesions are observed in prostate cancer patients [28, 59]. Thus, we examined the effects of PTN on osteoblast proliferation and differentiation in the presence of derived factors from the prostate Mat-Ly-Lu cells. 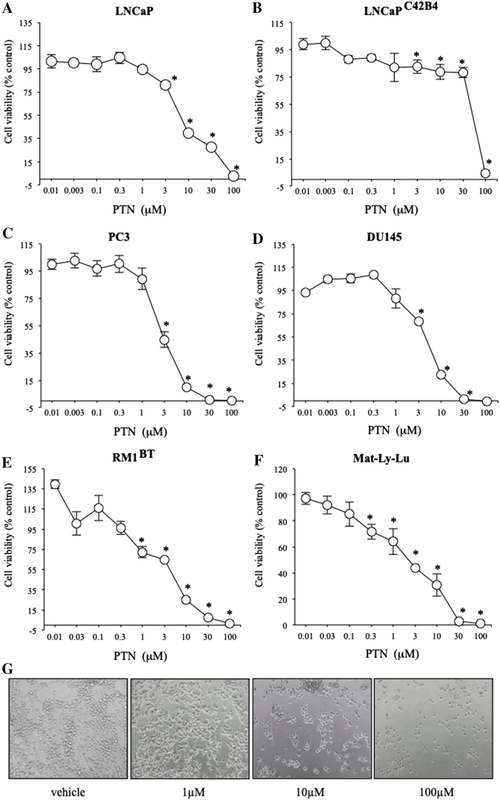 Exposure of mouse calvarial osteoblasts to conditioned medium from the prostate Mat-Ly-Lu cells increased alkaline phosphatase activity (Fig. 4c) and viability (Fig. 4d), and these effects were significantly enhanced by PTN at concentrations as low as 0.01 µM. Together, these results indicate that PTN enhances in vitro osteoblast number and maturation at concentrations that inhibited osteoclast formation under the conditions described. 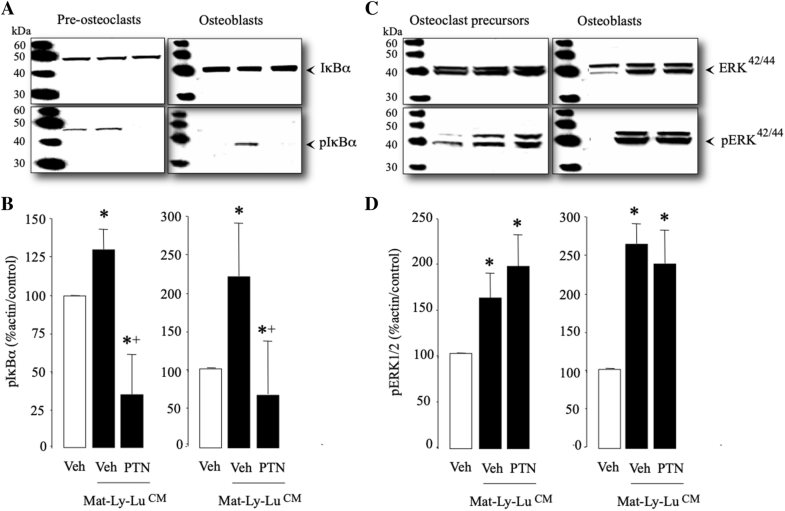 Western blot analysis of cultures of calvarial osteoblasts and M-CSF-generated osteoclast precursors showed that conditioned medium from Mat-Ly-Lu cells (20% v/v) enhanced the phosphorylation of IκB (Fig. 5a, b) and ERK42/44 MAPK (Fig. 5c, d) after 18 min (Fig. 5). Pre-treatment of osteoblasts and osteoclast precursors with PTN (20 µM) for 1 h prior to addition of conditioned medium reduced the phosphorylation of IκB but not ERK1/2 (Fig. 5). These data indicate that Parthenolide disrupts the activation of the IκB/NFκB signalling pathway by Mat-Ly-Lu derived factors. We took advantage of the cancer cell—mouse calvarial organ co-culture system (Fig. 6a) to assess whether PTN preserve bone volume in the presence of the prostate Mat-Ly-Lu cells. MicroCT analysis of the calvarial bone in these experiments confirmed that PTN (1.0 µM) significantly enhanced bone volume after 7 days of continuous treatment. Representative microCT images of calvarial bone from the experiment described are shown in Fig. 6c. To exclude the possibility this effect was due to the anti-proliferative effects of PTN on cancer cells, we went on to show that PTN (1.0 µM) had no effects on the viability of Mat-Ly-Lu cells in the mouse calvarial organ co-culture system (Fig. 6d), and it failed to induce caspase-3/7 activation (Fig. 6e) or cause nuclear condensation and DNA fragmentation (Fig. 6f). Cancer associated bone disease is a serious complication of metastatic prostate cancer [22, 23, 24]. The growth and expansion of prostatic tumour cells in the skeleton coupled with the development of osteosclerotic and osteolytic lesions are the causes of morbidity in patients with advanced disease [24, 26, 27, 28, 29, 30, 31]. NFκB signalling pathway has been implicated in the initiation, progression and bone metastasis of prostate cancer [10, 29, 32, 33, 34, 35, 36, 37, 38, 39, 40, 41, 42, 43]. In view of the fact that the canonical NFκB signalling pathway plays a major role in the regulation of bone growth, osteoclastic bone resorption and osteoblastic bone formation [11, 12, 13], we employed a pharmacological approach to test if the verified inhibitor of the canonical NFκB signalling pathway PTN disrupts the ability of prostate cancer cells to influence osteoclast formation, osteoblast differentiation and osteolysis. Prostate cancer cells interact with osteoblasts and clinical evidence suggests that prostate cancer osteoblastic lesions give rise to increased osteoclastic activity and thus osteolytic lesions and bone loss [25, 26]. Here, we provide in vitro evidence to show that PTN, acting on osteoblasts and osteoclasts, reduces prostate cancer cells and RANKL-related osteoclastogenesis. 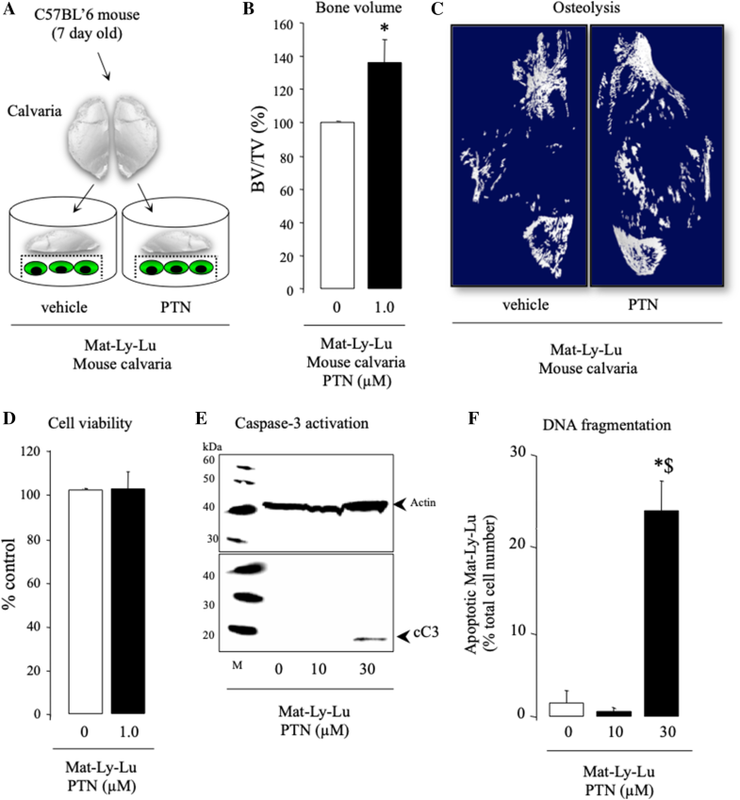 The evidence for this comes from the experiments in which PTN inhibited the ability of Mat-Ly-Lu prostate cancer cells to enhance the spread and adhesion of bone marrow derived pre-osteoclasts and the formation of multi-nucleated osteoclasts in the presence of RANKL or calvarial osteoblasts. Furthermore, PTN also inhibited the survival of mature osteoclast survival in the presence of conditioned medium from Mat-Ly-Lu cells, but it had no direct effect on osteoclastic bone resorption at concentrations that do not inhibit osteoclast survival. An interesting observation of our present study is that human PC3 and mouse RM1-BT and their derived factors—but not Mat-Ly-Lu cells—failed to enhance RANKL-induced osteoclast formation in our models. We cannot readily explain this except to note that previous studies have shown that prostate cancer cells such as PC3 and DU145 produce the RANKL decoy receptor OPG . 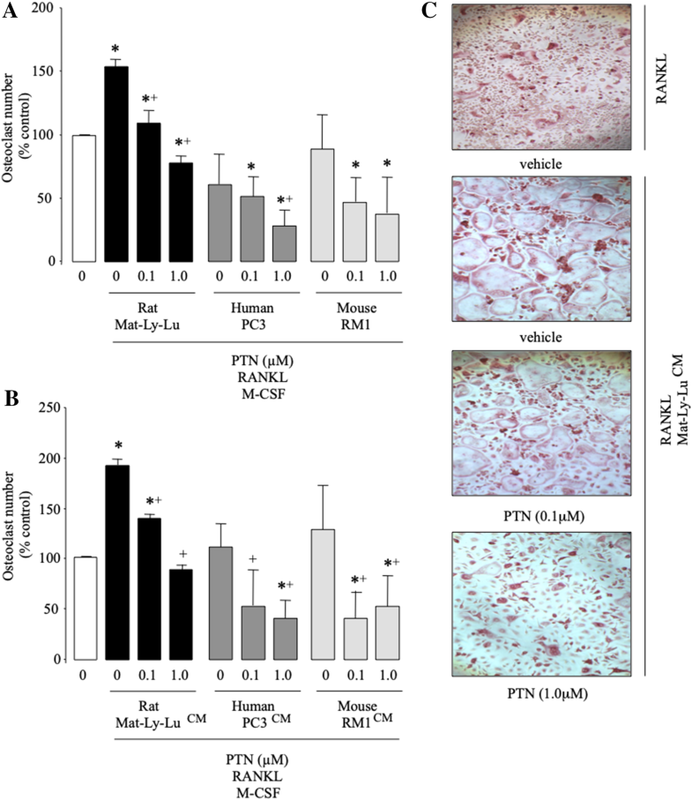 Mechanistic data showed that PTN reduced RANKL/OPG production by osteoblasts and inhibited both RANKL and Mat-Ly-Lu conditioned medium induced IκB phosphorylation in osteoblasts and osteoclasts. These findings are of interest in suggesting that NFκB inhibition suppresses osteoclast formation stimulated by RANKL as well as other NFκB stimulating prostate cancer-derived factors such as TNFα and ILβ that are known to be present in the bone metastatic microenvironment [24, 26, 27, 28, 29, 30, 31]. Of note, PTN had no effects on the activation of ERK1/2 by prostate cancer-derived factors, confirming the specificity of this agent to the canonical NFκB signalling. Prostate cancer cells in bone promote osteoblastic bone metastasis [25, 26]. In support of previous studies that have shown that inhibition of NFκB enhances osteoblast differentiation and maturation in the presence [47, 49] or absence  of cancer cells, we have found that PTN increased the ability of Mat-Ly-Lu prostate cancer cells to enhance osteoblast differentiation and cell number. The ability of this compound to enhance osteoblast differentiation and reduce osteoclastogenesis is broadly consistent with its osteoprotective effects in the calvarial organ - of Mat-Ly-Lu cell co-culture system. It is important to note that the osteoprotective effects of PTN in our model was achieved at a concentration of 1 µM that had no effects on the viability or apoptosis of the Mat-Ly-Lu prostate cancer cells tested, thereby excluding prostate cancer cell growth inhibition in this in vitro experiment. However, PTN (1 µM) significantly reduced the in vitro growth of Mat-Ly-Lu in the absence of the mouse calvarial. We cannot readily explain this except speculate that the presence of host-derived factors in the calvarial organ culture model may have contributed to the ex vivo growth inhibition by PTN. Notwithstanding this, our present data complement previous studies that reported that reduction of osteoclast bone resorption and stimulation of osteoblast activity due to NFκB inhibition reduce bone loss induced by disorders that include bone metastasis, inflammation, oestrogen deficiency, rheumatoid arthritis and Paget’s disease of bone loss [2, 4, 6, 8, 9, 10, 11, 12, 13, 14]. One important caveat of our present study, however, is that the increase in osteoblast number and differentiation by NFκB inhibition is likely to contribute to the development of prostate cancer related osteosclerosis—a common feature of prostate cancer bone metastasis in patients [25, 26]. In conclusion, our present findings confirm that inhibition of the canonical NFκB signalling pathway may have a potential role in protecting the skeleton from the osteolysis associated with prostate cancer. When combined with previous studies [34, 35, 36, 37, 38, 39, 40, 41, 42], these findings suggest that NFκB inhibitors as both anti-metastatic and anti-osteoclastic agents may be of value in protecting against skeletal complications associated with prostate cancer bone metastasis. However, further studies are needed to explore the role of NFκB in the initiation, development and progression of osteoblastic prostate cancer metastases, and ascertain whether, and to what extent, the promotion of osteoblast differentiation by NFκB inhibitors may limit the usefulness of this class of agents for the treatment of osteoblast-driven cancer associated bone diseases such as prostate cancer and sarcomas. For that, further in vivo studies are needed and ongoing. Silvia Marino and Ryan Bishop are involved in experimental, analysis and editing; John G Logan, Giovana Carrasco and Boya Li are involved in experimental; and Aymen I. Idris is involved in conception, experimental, analysis, editing and writing. This work was supported in part by a pump-prime grant from Cancer Research UK (University of Edinburgh) and Breast Cancer Now (University of Sheffield) grants to Aymen I. Idris. Silvia Marino, Ryan T. Bishop, Giovana Carrasco, John G. Logan, Boya Li, and Aymen I. Idris declare no conflict of interest.